There are several different forms of wills you can use to indicate how you want your estate settled upon your death. However, every state does not accept all of them and some have significant drawbacks. That doesn’t mean that you can’t or shouldn’t employ one. Speak with an attorney first to ensure that your will is legal and addresses all your needs. A simple will is a will in a generic format that you can purchase at office supply stores or download from the Internet; it leaves blank areas where you can simply fill in your personal information and bequests. You might also find an example of the format at a law library or community library and use that to create a simple will on your own. The terms are uncomplicated; someone using this type of will normally leaves all his assets to his spouse or adult children, names an executor and gives directives as to whom should care for minor children if there are any. Since probate laws vary from state to state, you should check with an attorney to be sure that the format you are using meets all your state’s particular will requirements. A mutual will is one into which you enter with someone else, usually a husband or wife. 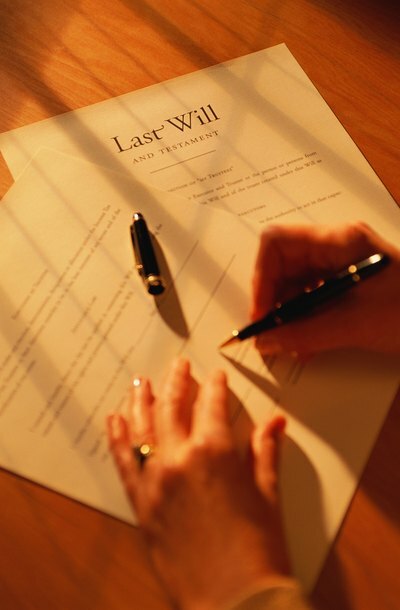 In mutual wills, sometimes called joint wills, each individual usually bequeaths all or most of his earthly possessions to the other and vice versa. Education.com warns that this is not always a good thing, however. These wills usually become ironclad at the death of either partner, prohibiting the survivor from making any changes later, such as for tax purposes. This sort of will sets up a trust into which your estate assets go when you die. The trust then pays out your assets to your beneficiaries either on a schedule, in a lump sum or however you specify. In a contingent will, also called a conditional will, you can set certain prerequisites for inheritances, usually an event that has nothing to do with your death. For instance, you might not want a spendthrift child to inherit until he turns 35. If you make your terms too bizarre, however, some state courts will not uphold your will in the event your beneficiary contests it. Few states recognize oral wills and even then, only under imminent-death circumstances when there is literally no possibility that you can make a written will before you expire. Sometimes, this is called a noncupative, or a deathbed, will. Lawyers.com advises that oral wills can only address issues of some personal property. Holographic simply means that you hand-wrote your will. The website Financial Web warns that some states do not allow this, so don’t just hand-write your intentions for your estate and assume it will be valid. Check with an attorney or your local probate court to determine how your state handles these. As the name implies, this involves sitting down in front of a camera and stating the terms of your will. Financial Web notes that this method can protect against future contests by unhappy beneficiaries or disinherited heirs, as long as you are coherent and don’t appear confused, because there is no doubt that you are conveying your own wishes. Some people make video wills in addition to printed wills for just this reason. A living will is not actually a will at all because it does not deal with your estate. It sets out your directives as to what measures you want taken should you ever become critically ill. A living will expresses your wishes if you are incapacitated to the point where you can’t voice your decisions yourself.